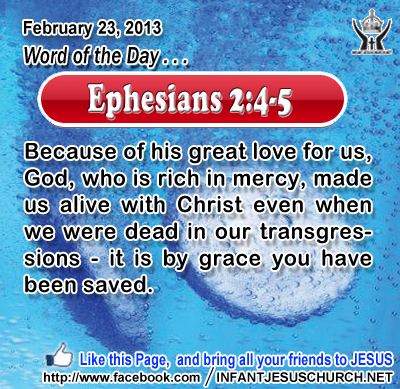 Ephesians 2:4-5: Because of his great love for us, God, who is rich in mercy, made us alive with Christ even when we were dead in our transgressions - it is by grace you have been saved. Heavenly Father, Thank you for extending grace when we have not deserved it. Thank you for giving mercy when we most needed it. Thank you for giving life when we thought our life was doomed and hopeless. May our wealth be in mercy and grace much more than money and gold. Help us to be more like you. In the name of Infant Jesus we pray. Amen. 43"You have heard that it was said, `You shall love your neighbor and hate your enemy.' 44But I say to you, Love your enemies and pray for those who persecute you, 45so that you may be sons of your Father who is in heaven; for he makes his sun rise on the evil and on the good, and sends rain on the just and on the unjust. 46For if you love those who love you, what reward have you? Do not even the tax collectors do the same? 47 And if you salute only your brethren, what more are you doing than others? Do not even the Gentiles do the same? 48You, therefore, must be perfect, as your heavenly Father is perfect. The original meaning of "perfect" in Aramaic is "completeness" or "fullness" – not lacking in what is essential. God gives us all good gift in Jesus Christ so that we may not lack anything we need to take out his will and to live as his sons and daughters. He knows our infirmity and sinfulness better than we do. And he assures us of his grace and help to go after in his ways. In the cross of Jesus we see the way of great love. Do we want to grow in the knowledge, wisdom, and love of God? Ask the Holy Spirit to set our heart on fire with the love of God. Give us, Lord, a humble, quiet, peaceable, patient, tender and generous mind, and in all our thoughts, words and deeds a experience of the Holy Spirit. Give us, Lord, a lively faith, a firm hope, a keen charity, and love of you. Take from us all dullness in prayer. Give us passion and delight in thinking of you and your grace, your loving compassion towards us. These things we pray for, good Lord, give us grace to effort for: through Infant Jesus our Lord.